Toyota meadows draw numerous pollinators including butterflies and bees. Photo by David Ammon. A Toyota Corolla rolls off the assembly line every 73 seconds at the plant in Blue Springs, Mississippi. But for the automobile manufacturing plant, building cars is not its only job; it also strives to build better communities. Toyota Motor Manufacturing Mississippi shares in a global vision established for its manufacturing plants: to be a company that shows consideration to the environment and investigates and promotes sustainable systems and solutions. 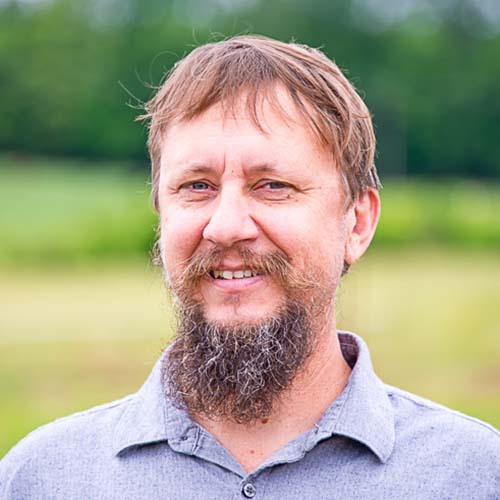 “Preserving and balancing the land we use to build our products is an important part of our environmental strategy,” said Sean McCarthy, environmental engineering specialist at Toyota Motor Manufacturing Mississippi. 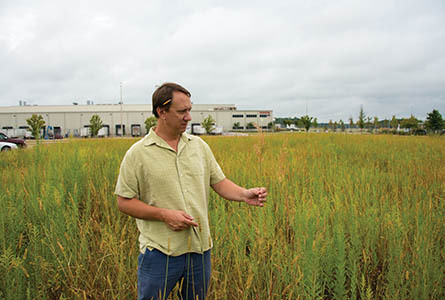 “The Blue Springs plant sits on 1,500 acres of land that was once forest, wetlands, and grasslands. We share this habitat with native plants and animals.” As such, Toyota team members work to create a sustainable environment for wildlife while also creating automobiles, McCarthy added. Dr. Tim Schauwecker examines the grasses and native plants in the Toyota meadows. Photo by David Ammon. The first step for Schauwecker was a soil sample and an inventory of the existing plants which germinated from the commercial wildflower mix seeded in the winter of 2012–2013. The species in the mix that were less successful were primarily adapted to climates and soils in other regions. “For example, California Poppy was one of the plants in the original seed mixture. It is not a plant that will do well in our climate and soils,” Schauwecker added. Three areas were specified for the pollinator gardens. Toyota was mowing the areas a few times per growing season which did not bode well for the native plants. 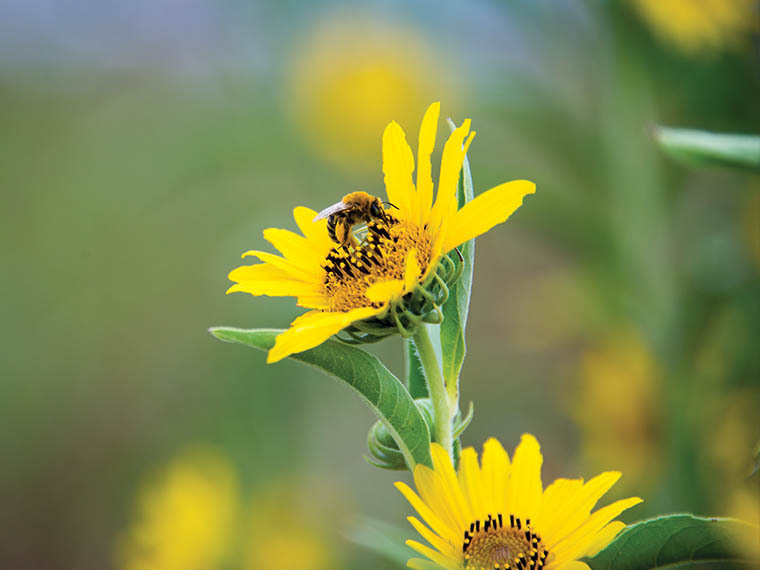 “The initial prescription for the pollinator gardens was to stop mowing and use prescribed fire to stimulate the growth of native plants and grasses,” Schauwecker said. “This saved Toyota labor costs and also provided a training opportunity for the company which employs a fire department/safety crew.” Toyota brought in local fire departments and their in-house team to conduct the first controlled burn in 2014. “Prescribed fire unlocks nutrients in the soil, prepares seeds for germination, and prepares the soil for seed growth in the spring,” Schauwecker said. “It also provides a training opportunity for the fire departments.” Each field allows for numerous experiments to compare burning and mowing. The research objective is to determine the best practices for establishing pollinator habitat at the site. The first garden is approximately one acre and is the most visible and smallest of the three areas. It is now managed with winter mowing and will eventually be managed with prescribed fire. The second garden is 1.55 acres and lies between two large parking areas. The garden has been divided into three treatments: a late summer burn, a winter mow, and a control where neither burning nor mowing take place. The third, and largest, garden is about 3.1 acres. It lies adjacent to one parking lot but is bound on its other three sides by a perimeter road. This garden is divided into several treatment areas including winter mowing, summer burning, and a control. Treatment boundaries, using firebreaks, allow access to the public and plant employees to view how the different management prescriptions are working in the field. A pollinator conservation mix was used to reseed the gardens in early 2015. A prescribed burn is planned for this fall and a winter mow after the first hard freeze. With just one year of treatments, the pollinator meadow is already a buzz with bees and butterflies. “We have succeeded thus far in establishing the three pollinator gardens,” Schauwecker said. “The process is relatively inexpensive and allows Mississippi State to partner with Toyota to create research and educational gardens. “Equally fulfilling is the benefit our undergraduate and graduate students receive by working on meadow ecosystems,” Schauwecker added. Focus: My research addresses the restoration and management of biodiversity and water quality in developed and agricultural landscapes.